American, former professional football player, who played as a linebacker for the San Diego Chargers. He has been reported on a few occasions in the 6ft 2 range, was described 6ft 3 at college, although at the draft was being called 6ft 4 &frac38;, which matched closely to what he was Measured in a clip. Merriman himself has been claiming on twitter "I'm 6'5" 270". Merriman's posture in the first pic isn't that much worse than in the second. Maybe only slightly but not that big of a difference. Technically Bennett's closer to 6'6" than 6'5", but regardless, 6'5" is a horrible claim from Merriman. If anyone wants to see Shawn Merrimens height exposed look up “bare knuckle booking with Shawn Merriman” on YouTube. Pause the video at 3:01 and see 6’5 Martellus Bennet absolutely dwarf him. They’re both barefoot. Canson, did you see the pics with weak 6-2 Larry English. He can look all over the place depending on pics. I've seen a couple or so where he looked as tall as 6'5" range, and at times as short as 6'1". But I go with strong 6'2" for him, because not only did he look around 6'2" with 6'5.75" measured Martellus Bennett, both being barefoot, but he has a 6'2 3/8" measurement. Merriman looks 6-2 physically here to me. It's been widely shown that looking taller than Tebow doesn't mean much. 6-2 Justin Hartley looks taller. 6-3.3 senior bowl measured Marcus Spears consistently looks 2-3 inches taller than Tebow. He looks way taller with Tebow than Merriman ever has. I was a little awe struck meeting Bruce. Now that dude is a legend. I was shaking hands with the all time sack king. George Rogers was measured at 6-1 3/4 and looked exactly like Merriman in person. Bruce Smith looked 6-3. He measured 6-3. He admitted he was 6-3 in his Hall of Fame speech. He looks 6-1 a lot as well. He also looks 6-0 sometimes. He was measured 6-2 at his pro day, so he's not 6-3. 6-2 Justin Hartley looks taller than Tebow. Just met Bruce Smith. Looked his measured 6-3 height. Did you guys see the pics with weak 6-2 Larry English. and then he only looks about an inch taller than Adrian Peterson. now I’m really confused. I’m really not sure what he’d measure under a stadiometer. perhaps Tebow’s dropping more in height? Found another 6-2 description of Merriman in the newspaper archives. I found a 6-1 3/4 measurement for George Rogers in the newspaper archives. Merriman with weak 6-2 Larry English. You can be 6-2 and measure 6-4 in shoes as many NBA guys do. Just look at last year's combine. Larry's eye level is flat out higher than Merriman's and he's struggling with 6-2. I wanna say Larry is actually the taller guy in the other pic as well. He was measured 6-2 at his pro day and looked 6-1.5-6-2 in person. I'm not a downgrader, and I could see Rock was 6-2 back in 2006. Myself and Danimal. Had an inch on Dwayne "the rock" johnson so he is at least 6'3". 6-1 Steven Jackson has an inch on Rock. Doesn't make him 6-3. So which is it Viper? Is he shorter than 6'1" guys or is he "max 6'2" as you always said for his PEAK. You actually agreed with Big G when he said Dwayne was 6'1" in person but I'm sure you forgot all about that. So yes before you thought 6'1" range but apparently now you think 6'1" Jackson is taller ? or not? WHo knows with you at least you're entertaining. This guy was measured 6'4" in footwear and is most likely 6'3" as he is taller than Dwayne. I really doubt Trump is only 236 pounds. That whole thing is a sham. It conveniently keeps him under the obese mark. @Christian: I never considered that. That’s an excellent point and I agree with what you said! Trump only has that “supposed” measurement from the doctor 6’3”. He was never measured is what it really was. Canson proballers has 204cm next to every 6-7 listing. 6-2 David Haye looks taller next to Rock than Merriman does. I agree, but there's less ambiguity with Merriman's case than with Trump's. Unlike Trump, Merriman 3 has official measurement listings of 6'2 3/8", 6'2" and 6'4 3/8". Trump only has one official measurement listing, which is 6'3". What do you make of the Ed Oliver measurement and scouts saying he's an inch shorter. Rock is not under 6'2" but lets be straight I remember you Viper as a serial downgrader here years ago. So lets just say your opinion is worth nothing to me. Keep living that 6'0" Rock fantasy its hilarious. The chances of Merriman suing because you have him at 6-2.5 are zero. "I once wrote an article about Schwarzenegger in which the editor at The Atlantic, a real stickler for defamation-proof published facts, forced me to use his listed height of 6-foot-2. I still get hate mail about that one from people who think I’m disseminating misinformation, and the comments section is nuts. It’s all dudes railing on me for daring to use the official heights and weights of bodybuilders, even though I was forced by the editor to do so." Rob lists Trump at 6'0.5" despite his official 6'3" "measurement", but Rob isn't being sued for that. I don't see Merriman ever suing Rob. Look at this. Ed Oliver supposedly measured 6-1.7 at the combine. Looks much more realistic. He doesn't look anywhere close to 6-2. @Christian: very well said! I was saying what I did because of the ambiguity meaning the various measurements. And Tebow's posture is a bit worse there imo. And still the difference is not large. Hard to tell what the true difference is between Merriman and Bennett in that video, it can look a nearly 4 inch difference at times. I will say though that physically, Bennett looks much taller than Merriman. Proballers has Buck Williams at 6-7. There are countless examples of celebrities who lied about their height and Rob listed them way shorter than their claims. Look at the Rock for example. He claims 6'5" but Rob lists him at 6'2.5" and it isn't a problem at all. No liability, no anything. Even Trump, who claimed 6'3" and was officially "measured" at 6'3" by his doctor, but Rob lists him at 6'0.5", yet Rob isn't in trouble. If Rob can get away with doing that to the president of one of the most powerful countries in the world, then certainly Rob can get away with doing the same thing to a retired football player like Merriman. Canson are you saying Rob would get sued? @Canson Yeah exactly. I understand the reasoning and there are different measurements being recorded for Merriman after all, whether he looks the listing or not. He looks 6’2.5” range there with Barkley. @Sakz: I think what Rob is doing is protecting himself from liability. Since he is not sure exactly how tall he is, he’s simply going with a safe estimate. And Merriman is a guy who has gone as far as to say that he’s 6’5” before on more than one occasion such as posting the video and even his quote. He was documented at 6ft 4 3/8ths too. And he looks nowhere close to it. That's the rub. @viper Rob wouldn't gain anything by wanting to make him taller. At the end of the day it is his site so he wouldn't blatantly inflate people. I mean he even states small fractions like a 1/4 on this site so that should tell you something. Pictures don't always do justice with height and even supposed measurements can have errors. Merriman is quite interesting because of the inconsistencies in what has been published for his height. He doubled down on the premise he is 6ft 4 range with that video. Is he a height frauder? Did the NFL give him 2 extra inches on purpose? If that were the case, then it means the NFL's reputation for reporting actual measured heights from the combine is called into question. Nowhere even close to 6-3.5 with Barkley. I don't believe that Rob purposefully tries to make Shawne taller, but he's probably still not convinced that he's 6'2"-6'3" range. I wouldn't force Rob to downgrade Shawne if he really doesn't want to. That still doesn't change the fact that the 6'3.5" listing is inaccurate. @Viper: no disrespect but that was a bit disrespectful toward Rob. I have a ton of respect for you as a poster, as well but that was unnecessary, V. At least Rob has, to his credit, offered an explanation each time as to why he believes Merriman is the height that he thinks he is in the pictures. He also has been very professional and respectful toward you when he’s interacted with you in the past, even giving you the benefit of the doubt in other instances. Sure I don’t agree with him on the topic of Merriman’s height, either, but I respect his views. I agree with you on Merriman’s height but I wouldn’t go and say that Rob has an agenda or that he’s making excuses because that is simply speculation and is not fair to Rob as he is actually the most objective person here on this site. He’s never exhibited any behavior to suggest otherwise. Nothing suggests that he has a hidden agenda. He has a delicate balance as he has to consider the potential risks of liability and protecting the site and posters, as well as trying to be as accurate as possible. 6-2.5 which would be closer to the truth. And he wasn't even measured that tall. Rob, you're great, but you are grasping at straws here for whatever reason. If he's disadvantaged it's just barely that it's not even worth discussing. Everyone else would agree he looks 6-2 max in both pics. You can compare his head size Click Here. I would have guessed Omar had more than a 1/4 inch advantage from seeing the photo on alamy. If we are saying that is a 2 inch error, then maybe other listings have potential for error too. What do you think of Rob's excuses with those pics which are laughable. Almost like he has an agenda to make Shawne taller. Like I said, he was measured at 6-2, looks 6-2, yet is listed at an insane 6-3.5. He wasn't listed that high in college!!! When it was found out LT measured 6-2 he listed him as that. When it was found out Shannon Sharpe was measured at 6-1, instantly changed to 6-1. Well you posted a couple of photos with Shawne at a disadvantage, I'm simply offering an explanation. In the same way I could say With Tim maybe even though they are same distance, Shawne might have road advantage and gaining a couple of inches over Tim. I can see how you would see anywhere in 3-4 inch range, though it's a shame they never stood side by side with same posture, that would have been interesting to see if it was as much as 3.5 inches. How is he anywhere close to 6-3.5 with 6-2.6 Luis Castillo and 6-4.3 senior bowl measured Vincent Jackson. Rob he's clearly over 3 inches shorter than both of those 6-5 guys. You have to account for distances, and angles. Rob, explain how he looks nowhere, nowhere in the same universe as 6-3.5 with 6-5.1 morning measured Nelson Rosario on a flat stage. That angle isn't going to help Merriman's height, it's so low that if you were 1 inch further from the camera it would knock a lof of height from the person further away. I really doubt he's 6-3 out of bed. 6-2.5 out of bed imo. Well I don't think Shawne is nearer, but a bit further. How much it can effect things is something that varies. @Shane: well said and you hit every point very nicely and fluidly. Viper was saying that when he met him in person that he looked 6’1.5-6’2” and coincidentally that’s how he looked next to Martellus Bennett. Bennett measured 6’6 1/8 at the combine and then Viper brought up a team measurement with the cowboys where he was down at 6’5.75. but that’s believable because the combine is held around an hour out of bed so he would have already lost height by that stage. Bennett typically looks the size of someone like Anthony Joshua or maybe Gronk. At that stage, say if I measured 6’3.75 at a normal low as opposed to 6’4.25, I would still claim 6’4” or about despite maybe even coming down to 6’3.5 at an extreme low. I claim 6’4 in real life now but only because I round down since that’s what I’m closest to, although at an extreme low which I hit very rarely, I do come down to about a mm over 6’4 although I don’t usually consider that as much. I’ve seen Merriman but wasn’t close enough to him to gauge it admittedly. In college he was listed 6’3 and pros 6’4”. Even seeing him in other pics, I still think that 6’1.5-6’2 is a bit low for him at times but he did look 4” shorter than Bennett at points in the video then 3.5 other times. Rob mentioned that 3” max is what he saw between he and Bennett. I have a hard time seeing less than that so I find him only going down to 6’3.5 as a bit odd even if using the 6’6 1/8 for Bennett. It really looks more than 3”. That’s closer to 4”. But I would probably go with 6’3 if Rob were accounting for that video. He has at times looked taller than 6’3” to what Rob is saying but doubt he is. Next to Drew Brees he looks 6’2” and change or 6’2”. Below is the video of he and Bennett. The best parts of judging the height difference is when they were both punching the bag around 3:00 onward. Both are barefoot. I personally agree with your estimate. I have estimated 6’2-6’2.5 as well and I think the 6’2 3/8 was his actual measurement at the Pro Day. I think 6’2.5 would be the better listing here over 6’3 or 6’3.5 but 6’3” is even more reasonable since a lot of other guys get early morning listings too but theirs are at least barefoot (presumably). I think Merriman got the boost due to him being small for a Defensive End as Michael Sam also did. Sam is 6’1” at a low next to the Rock and Sam got measured early morning at his Senior Bowl at 6’1 5/8 and 6’2” at the combine. Viper and I both Doing comparisons senior bowl was early morning that year as well as the measurements were identical for most players to where they were for the combine. Also look at Carson Wentz a couple years back. His combine and senior Bowl were also identical and they mentioned for the senior bowl that he took his physical “this morning” the day he did it. @Rob: what Christian is saying is correct though. The NFL does scree up and I’m sure that they do that on occasion. Viper already pointed this out before but I will again below. Look at Julian Peterson. @Rob I think it is basically zero chance Merriman would agree to a height measurement with you simply because guys that strongly claim shoe heights without admitting it is a shoe height really value their height. So he is a guy that isnt going to do this. No chance. As for his height, after looking at lots of data, this thread, photos etc it seems quite obvious he is right around his 6'2 4/10" pro day measurement and the combine at 2 inches higher was undoubtedly, no question in error. So I am saying using your afternoon height standard he is 6'2 1/4" range. 6'3" range out of bed. @Viper where are you finding all the different measurements for Star? As for Merriman, seems safe to say he falls under 6'3" barefoot. The instagram video saying 6'4 1/2" does not help. Doesnt show his feet and in America nurses often measure in shoes OR allow to measure in shoes by request. Rob, how is he anywhere CLOSE to 6-3.5 with 6-5.5 Omar Benson. He could be further from the camera and have less sneaker, the pavement could be flat. At most I can see 6'3" for Merriman in that pic, but 6'2.5" is just as possible. It's closer to the truth, but it's still not quite the truth. The truth is that he was measured 6'2 3/8". Any listing under 6ft 4 is really saying the NFL have screwed up and their combine was either wrong or a preferential measurement. 1 more inch to go Rob. 6-2.5 is closer to the truth. Merriman looks 6-2.5 MAX with 5-5.5 senior bowl measured Darren Sproles. Rob, he looks SHORTER than 6-2.5 barefoot with Bennett. 6-3.5-6-3.75 is pure fantasy, especially when he was listed at 6-3. His posture with Bennett wasn't great, but then 6ft 3.5 is a figure that I can buy for him, for now. Then why not? If 6'2.5" or even 6'3" is too offensive of a listing, then 6'3.5" is a good start. A downgrade for him is long overdue. The description is reserved mainly for describing or mentioning quotes, which is why it is worth mentioning he is trying to insist he is 6ft 4 at that measurement. I already uploaded the 6ft 2 screencap from the news archives. How about a 6'3 3/8" listing for now, if you don't wanna list him at 6'3"? He has both 6'4 3/8" and 6'2 3/8" listings so it'll be a fair split. I virtually haven't seen any posters here who actually believe he's a legit 6'4". a compromise listing of 6ft 3.5 is possible, but 2.5 I have yet to be convinced he's as short as that. cmillz he looked 6-1.5-6-2 up close with perfect posture. 6’4 is way too high... there’s no way he’d be eye to eye with someone like Tom Brady. @Rob: I’m willing to bet that the NFL isn’t going to respond. They won’t want to expose what is potentially done on occasion or that maybe the made a mistake. I bet if you get a response at all that it will be that he measured at 6’4 3/8” which he looks nothing like even if that’s out of bed because like Andrea even believed, that would make him a weak 6’4” guy 6’3.5-.75 which he certainly doesn’t look with Martellus Bennett who Viper also showed measured 6’5.75 a different time later in the day. Even if it’s not 4” between them, it’s definitely not less than 3”. I think 6’3” flat is even better than 6’3”. At least that was referenced in the comments on his picture although that looks like a shoe height more than anything. Rob I would just go ahead and put him at 6-2.5 now. NFL isn't going to tell you anything. Canson and Christian, go look up Chargers versus Cowboys 2009 on YouTube. Number 96 6-3 Travis Johnson looks like he has about 2 inches on Merriman. 95 6-3 Shaun Phillips clearly looks taller. 99 6-2 Kevin Burnett looks a tad taller. 6-2.4 measured Freddie Bishop wearing 56 in today's AAF football game looked a good deal taller than Merriman physically. Still can't believe Rob hasnt lowered Merriman to 6-2.5 after the best evidence ever. I tried to get someone at the NFL to even respond about Merriman, but nothing...nobody wants to check it out. Booger McFarland admits to being 5-11. That was a total mismeasurement. I'd say some, but it's in the minority. Many players don't have more than a 1.5" discrepancy between barefoot and shoe measurements. I think LT could be like Lamont Jordan. Interesting that Florida had 2 linebackers listed at their correct height of 6-1. CeCe Jefferson is 6-1 266-270. He looks the same size as Merriman back in the day. LT looks about 5'9" in that pic. 6-2 LJ Collier looks exactly the same with LT as Merriman does. 6-4 measured Dasean Downey is a linebacker wearing number 56 like Merriman. It's incredible how much physically taller he looks than Merriman wearing 56. @Viper: maybe he was listed as 6’7” in basketball then. But different sports will list people differently. Heck, Kyler Murray was listed 5’11” in Baseball and 5’10” in Football at the University of Oklahoma. I wonder when he was measured on Ourlads? From what we’ve seen Combine listings have had a wide variance from a Senior or Pro Bowl measurement. Meaning even with 6’6.25 and 6’5.25 measurements I don’t completely rule out the fact that at a low he still may be the latter. Irv Smith Jr. is a tall looking 6-2 guy. I can remember in high school picking up the paper and seeing Peppers listed as a 6-7 running back. Kyler Murray just measured 5-10.1 which is surprising. Nah, Peppers was only listed as high as 6-7. Even in high school. Julius Peppers was listed at 270 his last year of basketball. Don't see any difference between Welling and Merriman. Both 6-2. Merriman with 5-5.5 senior bowl measured Darren Sproles. Sproles is losing a bit of height in the 2nd pic. Yeah he might have been 6-7.5 at the very most. Like I said he looks 6-8 in his high school basketball team picture his senior year. Especially with 2 other guys I know. Briscoe's 2013-2015 measurements have got to be errors. There's no way a 6'1" guy would be 6'3"-6'3.5" in shoes, let alone basketball shoes. If the pattern's reversed (his measurements getting taller as the years go on) then maybe that indicates growth, but that's not the case. His earlier measurements are taller than his newer ones. Brandon Watts is a 6-1.6 measured linebacker who is listed at 272 pounds. Yeah Merriman is easily getting 1.5 inches in the boot footwear he wears. The 6-2-6-2.5 for Briscoe made no sense. I was like how is he that tall when he's clearly shorter than his 6-2 measured Kentucky teammates DeAaron Fox and Malik Monk. He's a 6-1 guy that measured 6-3.5 in shoes. I wouldn't completely rule out that he wore boots either. Sometimes he wears boots in pics as well, although not the super thick ones like logger boots. I don't think it's really defamatory to believe that an athlete's using steroids, especially when you have probable causes. It's not like it's a felony or anything. Some people have accused famous people of doing much worse. Canson I was watching an old Maryland basketball game and Buck Williams looked slightly taller standing next to 6-8 listed Terry Gates at the free throw line. I doubt Merriman's anything over 250 lbs today. He has slimmed down some since he retired. As for his doctor's measurement, occasionally doctors and nurses do mismeasure people when they don't bring the stadiometer's board all the way down to the head. One time I was overmeasured by about 2cm, but I had thick hair back then. Merriman didn't have thick hair to the point of being overmeasured by 2cm. If he was overmeasured, I doubt it was more than a cm. Ironically the only reason I saw him up close in 2006 was because he was suspended for steroids attending the Maryland-Miami football game. As you can see he looks way smaller than Merriman. Hard for me to see why this guy is listed above 6'3". He was listed as that in college, and very rarely can manage to look more than that (quite honestly, he looks 6'2"). But that doesn't mean anything. Some people can weigh heavier than what they seem. 272 at 6'2"-6'3" isn't unbelievable at that size, especially when you notice how he was a lot bigger in 2005 than he is in recent years. If you're not even gonna list him at 6'3", then you should at least list him 6'3 3/8" here, since both the 6'2 3/8" and 6'4 3/8" listings have been highly debated on this site. That would only be fair. Or he was just flat out measured wrong. Staring at Rising's screencaps, that's an easy 4 inches. Merriman looks what I saw him as. Nobody thinks Russell Westbrook is 6-2 If you look around. Merriman looks between 250 and 260 today. Good example of how much bigger Merriman was. Makes fun of how big his neck was. 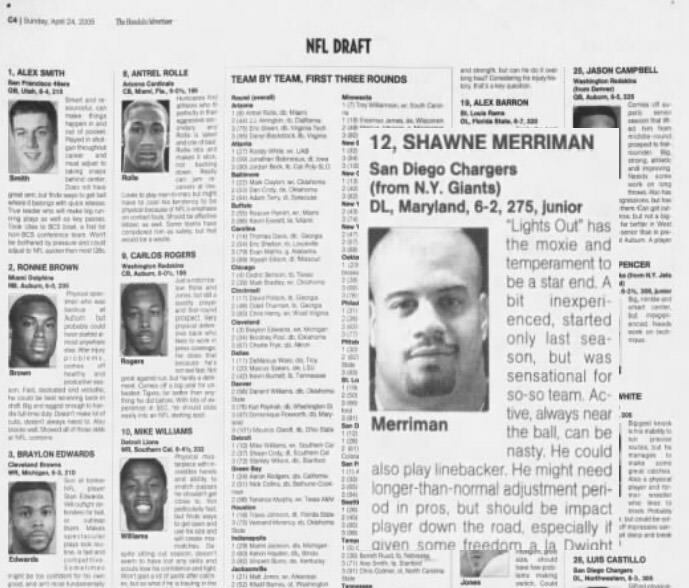 Look how much bigger Merriman looked right after his rookie season in 2006. It's almost like a different guy. Definitely looks 270 plus pounds there compared to today. Yes, he was over 270 in 2005. He looked like Batista in a couple of photos. And your weight at either 6-2 or 6-3 isn't much difference anyway. He was found to have steroids in his system. As far as the references above, it’s fair to add the video with Bennett as it matches up closely with his Pro Day just as you said the video with the nurse “claiming” to measure him aligns closely with his Combine. I give him 6'2.25" worst case. A 6'2.25" guy can easily be mistaken for 6'2" flat. My theory is that he was measured 6'4.25" in the morning with shoes on, and was rounded up to 6'4.5" by the nurse. Some shoes can easily give 1.25" of course, so he would be 6'3" barefoot at morning, and you subtract 3/4" so you get 6'2.25" at night. At 6-3 I can measure 6-5.5 in my brother's bigger shoe size raising my toes inside. Im not gonna mistake a 6-4 guy with perfect posture for 6-1.5-6-2 up close. @Viper: that’s interesting. Lamont Jordan shows a 5’10 1/4” combine listing. That goes to show that they aren’t always accurate. It's a big error if it's true. Either he was 6ft 2 3/8th or 6ft 4 3/8ths. His 274 weight doesn't make as much sense if he was only 6ft 2, but more if he was over 6ft 3. Let's just give him 5'11. 6-2 Ryan Davis looks physically taller than Merriman. 6-2.3 and was listed at 6-4 he would be listed 6-4 here. Why didn't Merriman deny Rudy Gay calling him 6-2. Merriman with 5-9.5 Lamont Jordan. Merriman is stretching out as much as he can and still looks MAX 6-2. A big question is if the NFL put out there at the draft he was 6ft 4 3/8th and he wasnt, then mistakes happen or the NFL can make up figures. "There's certainly a fair amount of photos/clips which can be used to say he is under 6ft 3,"
Yet I don't see you calling his unbelievable 6'4 3/8" "measurement" as "nonsense". While I don't believe he's as low as 6'2" flat, there's sure as heck of a better chance of him being that than being 6'4 3/8". 6-4 Da'Sean Downey by 4 inches, listing him at 6-0. Rampage you do upgrade so many here by 1-2 inches. Rob, Merriman has perfect posture with barefoot Martellus Bennett on video and looks 6-2. He looks 4 inches shorter. That's the best evidence there will be. Best evidence maybe ever on this board. Both guys barefoot on video. Sorry Rampage but you have blinders on. He was measured at 6-2 at his pro day. Ron, do you seriously believe this 6ft2 nonsense? People are entitled to believe whatever figure they like. There's certainly a fair amount of photos/clips which can be used to say he is under 6ft 3, but I personally haven't seen enough to think of giving him such a figure and would still say he might be a guy who walks and stands shorter than he measures. Agree Canson. The Martellus video is the best evidence by far since both are barefoot. @Christian: 6’3” is a good start for him. I still believe he’s 6’2” range but we can tell for the most part that he’s not over 6’3”. I don’t understand how and why the Martellus Bennett video isn’t factored into the listing or even description since it’s clear that that is not just a 1.75” difference even assuming we are only using their combine listings when we saw that Bennett was 6’5.75 a different time later in the day. While a 3.5 or 4” difference looks most feasible I would say it is no possible way it’s less than 3”. @Rob and Viper: being Viper also provided that Bennett is 6’5,75 at a low it’s safe to say that Merriman likely isn’t more than 6’2.75 since you alluded to 3” difference between the two. While I believe 6’2” I think then 6’3 is a good start for him. Even in the video where he was measured at the doctor we saw on the replies to him claiming 6’5” someone else said 6’3” although that looks like a shoe measurement. He’s definitely not anywhere near 6’4”. Carson Edwards measured 6-1.5 in shoes. Could be the same reason Merriman measured so high in that video. Andrej's standing closer to the camera than Trump, than Merriman is though. Compare 6-3 admitted Andrej Plenkovic to 6-2 Merriman. It's not a really easy way to compare. You'd have to line up Austin's head in proportion with both Merriman's and Kelly's pic, and see the difference between Merriman and Kelly. But the problem is that the camera positioning isn't that great with the Kelly pic. That article underlisted Nate's height. He's most likely not under 5'11.5". 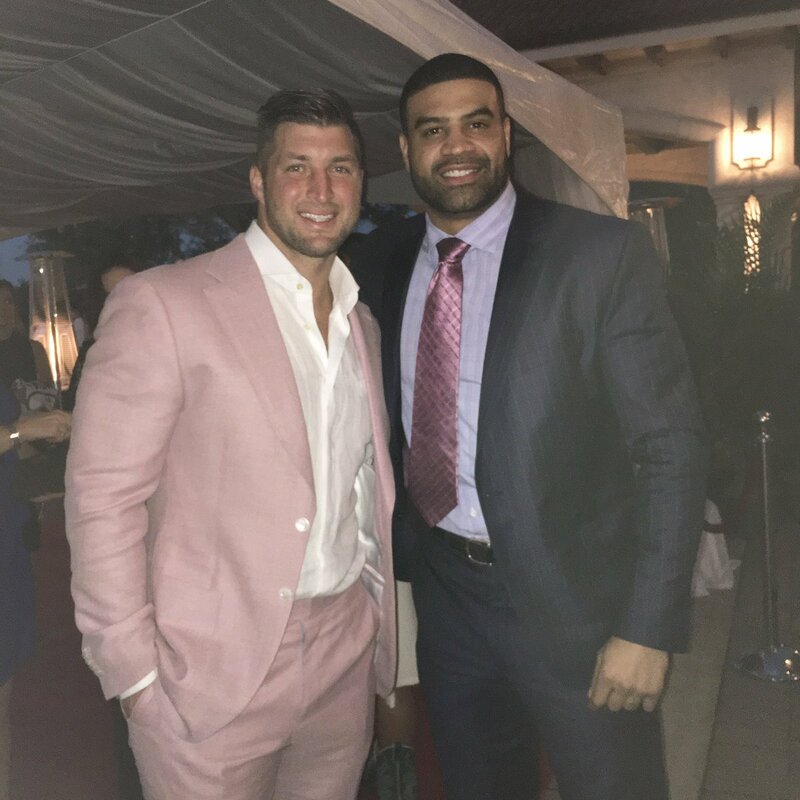 Merriman can look a decent 6'3" in that pic assuming Nate's 5'11.5"
6-5.5 Tommy Kelly and Shawne Merriman. Merriman trying to look even taller than 6-0 Ray Lewis and still looks 6-2. Merriman just doesn't look more than 6-2 physically here. Merriman with 6-5 Jamaal Anderson. Merriman looks shorter than 6-2 Luke Rockhold, who has been listed at 6-2 before. Collier looks taller than 6-2 Suge Knight physically. Look how tall 6-2.2 senior bowl measured LJ Collier looks in these clips. He's towering over everyone in those high school clips. More so than Merriman in his. The interviewer even says he's like the tallest guy in his games. Merriman looks 6-1.5-6-2 with Trump. What I saw him at. Trevor Lawrence looks his admitted 6-5 with Trump. Merriman looks about 4 cm taller than Trump in that pic. I don't think he gets much advantage despite being slightly closer to the camera and he might be slouching more, though not nearly enough to get him close to 6'4" since Trump himself rarely stands his full height. Booger McFarland admits he's 5-11 and not his measured 6-0. That clip's just more evidence that Merriman's nowhere near 6'4". When he stands equally next to Shilique who's most likely 6'4", you can see about a 1.5" difference. 6-5 admitted Trevor Lawrence with Trump. Cox is probably 6-5. I've never seen or heard of a 6-7 listed college basketball player being only 6-4. But I did see a listed 6-7 college basketball center from a D3 team at McDonald's look just 6-4.5. He looked a weak 6-5. There's a fair amount of movement between them, so I am not sure what difference there might be.